I'm so glad that it's starting to warm up here in Oklahoma City. Being stuck inside for most of the year can get pretty depressing, so Spring makes me so excited! 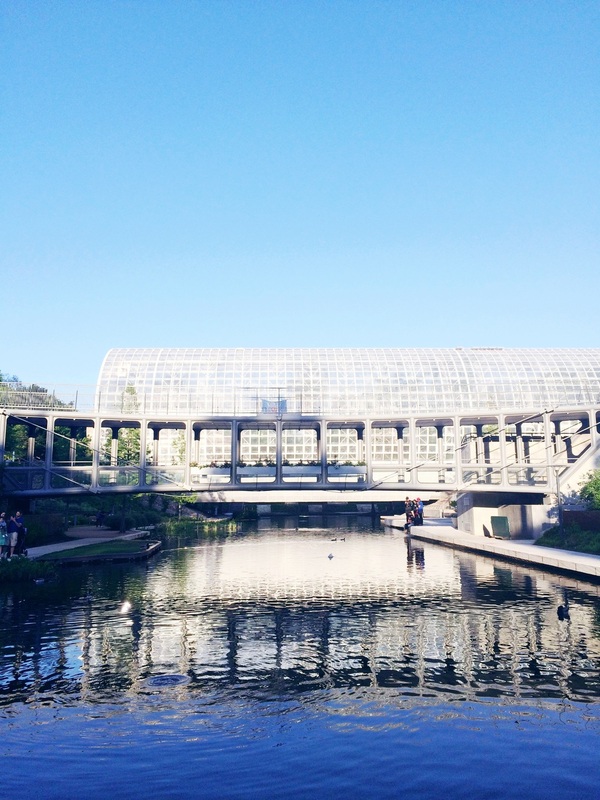 I had the chance to revisit the Myriad Botanical Gardens with my husband and two boys the other day and it was just really nice to see all the blooms and greenery and get inspired by nature again. The Myriad Botanical Gardens is located in the heart of the city and is directly across the Devon Energy Center - the tallest building in Oklahoma City. I just learned that the original idea of the gardens was to create a space similar to the Tivoli Gardens of Copenhagen, Denmark. How neat! I'm not sure if they accomplished that, but it's really an amazing place nonetheless. There's also a greenhouse called the Crystal Bridge Tropical Conservatory, which I have yet to go inside of. I always feel so inspired everytime I go to the gardens, and my phone always runs out of batteries because of all the snapping I do! It was a much needed getaway. As for the blog, I've finally got around to updating the site, and I am so so motivated to get back into posting more content on here. I've been MIA for about a month, so I've had a lot of ideas for the future of this site running through my head. I LOVE blogging; Life just got so hectic and it took me a while to get back to my creative space. I'm excited to feel inspired again, and I have a few things in the works. I've been wanting to update the site for a long time and give it a more modern, minimalist, and bright aesthetic to match my changing tastes. So, I created a new logo, changed a few things, and I think I accomplished the new look, which makes me feel really inspired. There's something about changing things up that gets me energized. I've always been that way, and I really get bored of things very fast. You'll probably see a lot of rearranging here because I'm always making things feel new and fresh! I hope you like the slightly new design. Let me know if you like it! Besides the blog remodel, I have been working on a project since last month. If you follow me on Instagram, I've posted quite a bit about my latest obsession. Why must I get obsessed with so many things all the time! I'm obsessed with getting obsessed. Ha! So, this latest obsession is with succculents and cactus. Well, I've always been obsessed with them, but since I've been a plant-killer my whole life, I didn't have the guts to try my hand at these babies. That is until someone inspired me on Instagram to start propogating my own succulents, and it helped that my husband surprised me with my first batch of succulents shortly after. Thanks hubs! I now have about four trays of succulent leaves that I'm propogating. Caring for succulents has been exciting for me and so I've decided to create succulent gardens as well! I've received so much amazing feedback on Instagram, so it's really something that I want to continue sharing with you guys. The great news is that I'll be launching a shop here on the site really soon and will be listing mini succulent gardens that you will be able to add to your cart and have shipped to you! I will also be slowly adding more things to my shop as time allows, so more will be in the works for that. If you want to stay current with what's happening, I post more frequent updates on Instagram. That's my quick update for now. There's so much more on my mind, but I don't want to overwhelm this post (and you). One last thing: What would you like to see more of here on Helly Lovely Living? More DIY? Home Inspo? Any specific topics? I'm all ears. I have a few things coming up that I can't wait to share with you all. I'll be back at it in a few days! Have an amazing weekend!